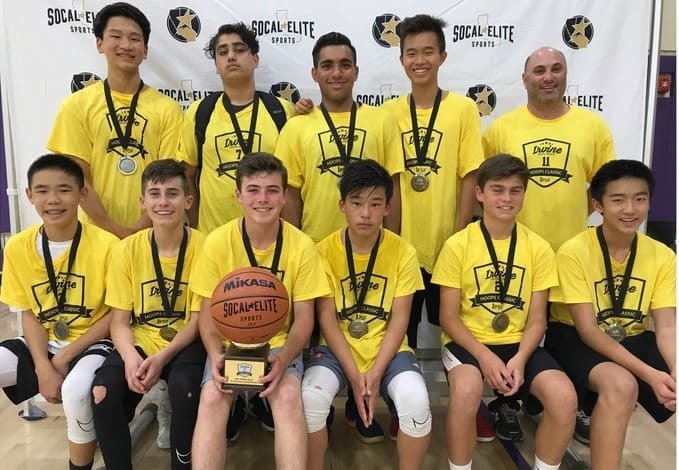 On Friday, March 9 and Sunday, March 11, SoCal Elite Sports hosted the 15th annual Hoops Classic Basketball Tournament to benefit Irvine Public Schools Foundation. The Hoops Classic is a school-based tournament, with teams comprised of players from individual schools in the city of Irvine, including boys’ and girls’ teams in grades five through eight. This year, over 550 students from 31 schools participated in the tournament, 64 teams in total, including 16 girls’ teams. The Irvine-based Hoops Classic will serve as a fundraiser to benefit Irvine Public Schools Foundation, a nonprofit organization focused on enriching the educational experience of each child in every school. This basketball event is the final phase of a larger tournament series called the Irvine Tournament of Champions, consisting of soccer (Harvest Cup), flag football (Winter Bowl), and basketball (Hoops Classic) tournaments. Schools earn points for their performance in each tournament, and the school with the most points at the end is awarded the Champions Cup in the spring to display at their school the following year.